When you hear of "Pan de Amerikana", you'll guess that it's a bakery. Well that's true. 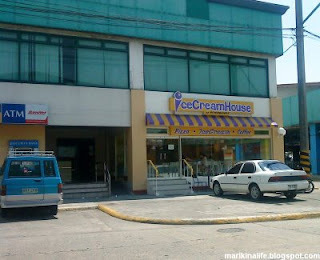 But their main branch in Marikina is so much more than just a bakery. It's a cozy restaurant too. My high school classmate's brother is one of the owners of this unique establishment. 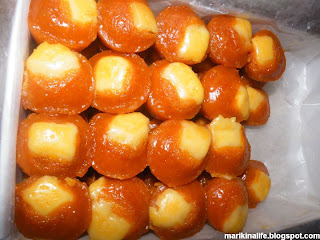 First off, the pandesal alone is one big reason why people buy here on a daily basis. They tag their pandesal as 1950's pandesal. They bake their own wheat pandesal and the size is enormous for it's very affordable price of P4.00 per piece. It's best eaten hot which they always have a fresh new batch newly baked from their chimney-like cement oven... just the way bread was baked in the olden days. 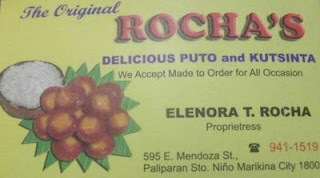 I'd suggest you'd buy your take-out pandesal after dining for a whole Pan de Amerikana experience. The restaurant is semi self-service. You order your food at the entrance where the counter is, proceed inside and find a place to seat, and they'll serve it in a few minutes. While you're waiting, you can play. Yes , play! The uniqueness of this restaurant is that chess enthusiasts will go gaga over this restaurant. All the tables have chessboards imprinted and embedded on every table and chess pieces are available at the front where you can play a friendly game of chess at the convenience in your own table. Would you like to add difficulty to your game ? A lifesize chess board can be found at the far end of the restaurant. These huge pieces require you to physically pick each one up when moving them. There's a huge stop clock at the side too. If you want a wider perspective, there's an elevated platform you could get up on to see the entire chess board. They also have some wooden sungka gamesets and darts if you'd like to play alone. The place is also reminiscent of a tranquil sanctuary with a pond full of fishes, a bridge, memorabilia, a gorgeous landscape, lots of beautiful and hanging plants, miniature windmills, a transparent waterfall wall and a balcony for children to play and see the exterior as if the restaurant were a fortress. There's also a stage with a huge flatscreen TV and extra huge high-powered fans for proper ventilation. The entire restaurant also offers free wifi. On one side of the main interior are pictures of Filipino celebrities of the '60's and '70's with some "then and now" pictures of them side by side. A display board at the entrance shows pictures of several famous people who have visited Pan de Amerikana. There are also a lot of vintage statues and antiques scattered throughout the restaurant. 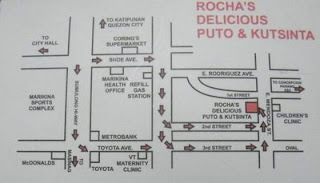 The food on their menu is mostly Filipino with the myriad variations of the "log" family (tapsilog, longsilog etc). They also have eat all you can buffets during certain days of the week. 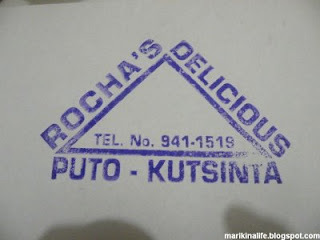 Of course, you can order fresh pandesal with filling straight from their oven. 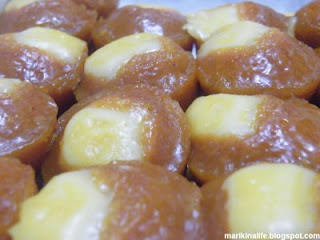 They also offer some "kakanins" like palitao and kutsinta. 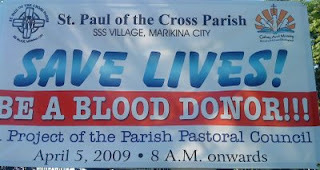 Overall, this place is a must see and visit Marikina attraction. The ambiance is one that will take your mind off the busy metro and relax and unwind feeling the calmness of the restaurants surroundings. 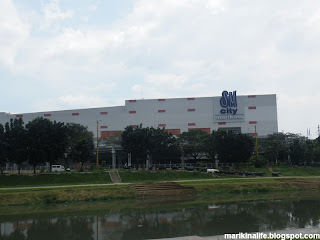 SM City Marikina will be holing a 3-day mall-wide sale on March 13, 14 and 15, 2009. Up to 50% discounts on selected items will be up for grabs. Too bad I'll be out of town during the sale. Hope you get a good bargain and happy shopping ! I discovered this coffee shop in a strange way. I was having my car fixed at Rey's Electric Automotive Shop at the corner of Gil Fernando. While I was waiting for the car to be serviced, I walked around the corner and was surprised to see a coffee shop. The exterior looked like it was a coffee shop of a hotel but in the heart of a residential area. And it was a break too from the busy streets of Gil Fernando Ave. I finally got to try them out a month later with my blogger friends. The inside is cozy. The interiors are so well decorated like an elegant sala of a modern day mansion, that you'll forget that this is just behind a bank, a school, a car repair shop and the houses surrounding the area. There are pieces of furniture like comfty sofas, elegant lights and lamps, high-dangling curtains, artistic wall-mounted frames and their unique love seat with matching pillows perfectly fit for two. Lighting is just right to relax the eyes. This is all what you'll see the moment you step in. And we haven't yet talked about their food and drinks. I ordered a cafe mocha. They call their servings "Executive" and "Tycoon", representing "Medium" and "Large" respectively. In a way, it's like a self-gratifying notion of whether you want to be an executive or tycoon for the day. Their tycoon serving is huge. I was served a big mug of cafe mocha with a generous topping of whipped cream and a dash of chocolate that entirely covered my drink. I have to say it was a tasty mix. My girlfriend ordered mint tea and we were both surprised that instead of given a cup of hot water and tea bag, she was served an entire teapot of Moroccan Mint green tea. That was a delightful surprise since it was obviously more than a regular cup of tea. Aside from cold and hot variations of tea and coffee blends, they also offer desserts like slices of cakes and pastries. Did I mention that they have free WIFI and it's really fast ? It's another reason to stay and enjoy your drink and food. The first time I saw their name, I was thinking what heritage or culture does the name "Biksa" come from. I learned through a TV feature that they're called Biksa Coffee, so when someone asks you where you are in Tagalog, you'd reply "Sa Biksa Coffee ako", which when heard in another manner can translate to "sabik sa coffee ako" (I am fond of coffee). If you do pass by the area, I suggest you try them out. I heard that they're open till 1 or 2 am. 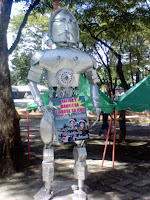 If you're in Marikina, you'll see traces of this everywhere... 10 feet high scrap-metal robots. 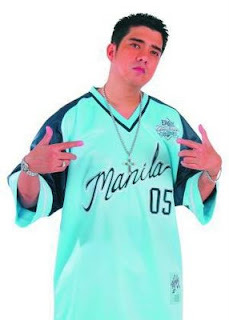 It's part of what our Marikina Mayor, Marides Fernando described as the city marked its 11th cityhood anniversary in December 8, 2007. The transformation from a town of Rizal to a munincipality of Metro Manila to what it is today as Marikina City is what is being celebrated. 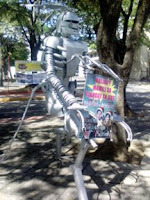 The local government in coordination with the Engineering Office placed 56 life-size robots scattered through key and major thoroughfares to symbolize the city's transformation. Aside from this, you'll see some posters and billboards of Marikina City officials' heads being placed on top of the same robotic bodies used in the "Transformers" movie. It's kinda cool and worth taking pics of. The newly constructed Marikina Convention Center has a scorpion-like robot in front. 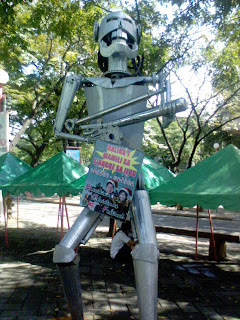 One of the robots along the side of Dutch Marikina seems to be shooting your way. And if you drive fast enough, you just might move your head by reflex to avoid the robot's gun pointing your way.